POWER giant NTPC has signed a MoU with IRCTC Ltd. on October 5 for setting up manufacturing facility for packaged drinking water (Rail Neer) by IRCTC at NTPC Simhadri, using NTPC’s patented Flash Desalination Technology (FDT) up to one lakh litres per day. the agreement to other projects of NTPC is also being explored. According to an official statement, the facility will utilise patented Flash Desalination Technology (FDT) developed by NTPC Energy Technology Research Alliance (NETRA), the Research & Development arm of NTPC. The technology has been developed for production of quality water (desalinate/ distilled/ drinking water) from sea / brackish water utilising waste heat from flue gas of power plant. NTPC has already set-up a facility for production of 100 tonnes per day of desalinated seawater at NTPC Simhadri STPP using this FDT technology, which is running at full capacity since March 2017. The NTPC and IRCTC are also exploring the feasibility to set up similar facility at other locations like Talcher and Solapur. Rail Neer (mineral water) is a product of the Indian Railway Catering and Tourism Corporation (IRCTC) under the Ministry of Railways. 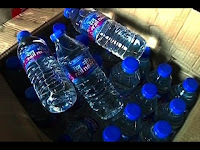 Rail Neer, run by the Indian Railway Catering and Tourism Corporation (IRCTC), a subsidiary of the national transporter, has seven plants with a bottling capacity of six lakh litres per day. The railways plans to set up 11 more bottling plants across the country on public-private partnership (PPP) basis. The brand has a captive market at more than 7,000 railway stations and more than 1,000 trains, as railway vendors can sell bottled water of other brands only when Rail Neer is not available. In 2017-18, Rail Neer contributed about Rs 170 crore or 11 percent to IRCTC’s total revenue. Meanwhile, tenders have already been floated for setting up more such plants in Kota, Visakhapatnam, Bhubaneswar, Ranchi, Nangal, Vijayawada, Guwahati, Bhopal, Ahmedabad, Jabalpur and Bhusawal — will be awarded by the end of this year. Indian Railways will provide land either on its own or through a memorandum of understanding with state governments.